I have been feeling a bit down recently, with an overwhelming feeling of “What is the point?”. 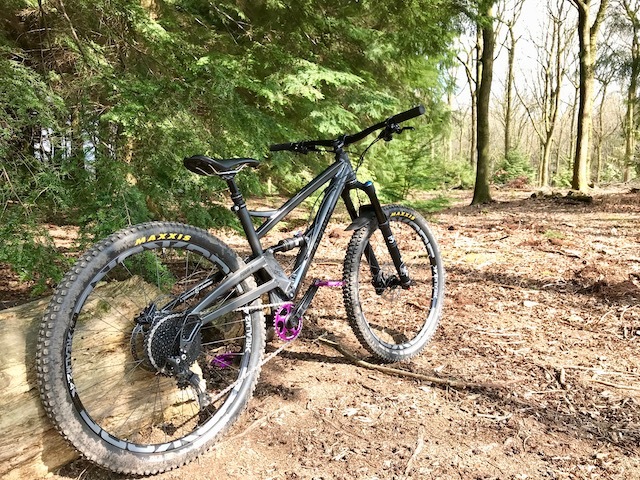 It is probably a combination of being busy at work, lack of sleep from doing the late shift with Henry and not having time for my usual coping mechanisms – yoga, coding projects and riding my bike. However I am feeling much better after a day of bikes in the sun. Getting out on my bike is always something that lifts my mood, it must be the combination of exercise, fresh air and adventure! Whatever it is, I really needed it today! 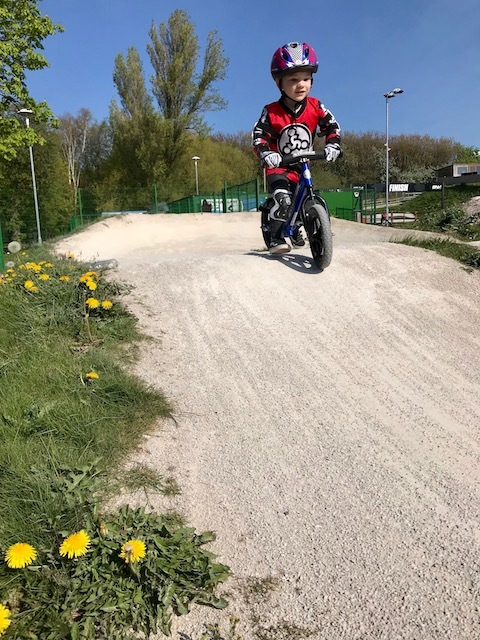 In the morning I took Owen to his usual #supersaturday Ready Steady Riders session at the Birmingham BMX track. Owen was riding really well. In the last few weeks he has really got the hang of his Strider balance bike, taking his feet off the ground and well, balancing! He is also gaining in confidence on the bike and really enjoying himself. With the nice weather we have been having I was expecting the session to be busy, but it was really quiet. So towards he end of the session Coach Kazzi asked if the riders wanted to go on to the “big track”. The big track is a full sized UCI spec BMX track – the sort of thing you may have seen at the Olympics, as opposed to the mini “Strider track” that Owen usually rides. They were only using the last part of the finish straight, but even so it was a big moment for Owen. He needed help on the steepest section – it was big enough and steep enough that I would think twice about it on my bike with brakes, but he aced the rest, which was still much bigger than the Strider track. Owen seemed so happy each time he passed under he big “Finish” banner. It was a morning full of proud Dad moments. 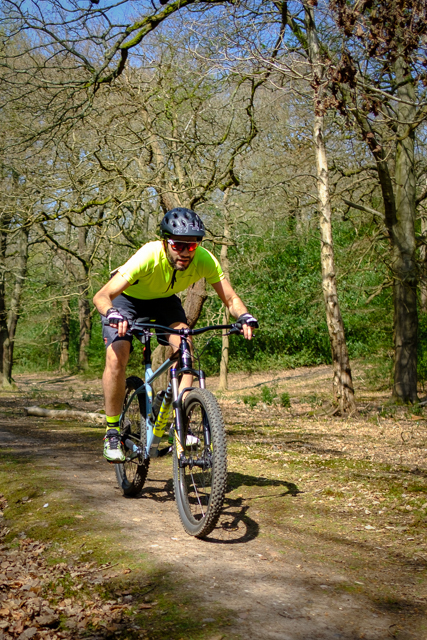 In the afternoon I joined my friend Partho for a ride around Sutton Park – his local trails, which I had not ridden before. It was just a gentle ride, as Partho is recovering from being knocked off his road bike earlier in the year and I tweaked my knee going over the bars on the way home from work earlier in the week. When we first arrived at the park it was extremely busy – to be expected on a sunny bank holiday weekend. By the time we climbed the steep hill to the top of the park we had the trails to ourselves though. On the climb I noticed that my heart rate monitor (a Wahoo Tickr, linked to my Apple Watch) was showing “2..”, which I assume means heart rate over 200 beats per minute. In any case my heart rate was higher than could be displayed. I later found out that the hill is known as “Cardiac Hill”, which figures. We followed some fun single track back down the hill, stopping for some photos before climbing back up “Cardiac Hill”. At the top the trail was blocked by two wild Exmoor Ponies. I had seen warning signs dotted around, but expected it to be like the bear signs in Yosemite National Park, where we did not see any hint of a bear. This time we took a mellower route down the hill, past more wild ponies, which unfortunately did not want their photo taken. The trail culminated in either a steep up and over bridge or a ford. Both looked like fun, but as it was such a warm day I opted for the ford, which was just that little bit too deep to keep my feet dry. We finished the ride with a gentle cruise back to Partho’s house, stopping for an ice cream before we left the park. What a great way to spend an afternoon! Last year I blogged about switching from my Canon 5D DSLR to a Fuji X-T2 mirrorless system (and also my experience one month on). Rarely in these situations do you get to switch back, however due to the struggles of trying to get a newborn and a toddler out the house (Henry needs loads of stuff and Owen is a typically stubborn two year old) I forgot to put my camera bag in the car when we visited my parents for Mother’s Day. I knew my Dad had his 5D tucked away, so I asked if I could borrow it, along with his 85mm f1.8 prime lens. After trading in my Canon kit, getting to use an almost identical kit was a rare opportunity to compare the systems again. My first thoughts were “this is huge” and “how do I turn it on?”. Even after ten years shooting Canon, my muscle memory has switched to Fuji after only a few months – fear of learning a new system should not be a barrier to changing! When I started shooting, the fact I was using an optical viewfinder passed me by. This surprised me, as seeing the result before pressing the shutter is one of my favourite things about mirrorless cameras. Maybe the X-T2 electronic viewfinder is good enough to be indistinguishable from an optical viewfinder? 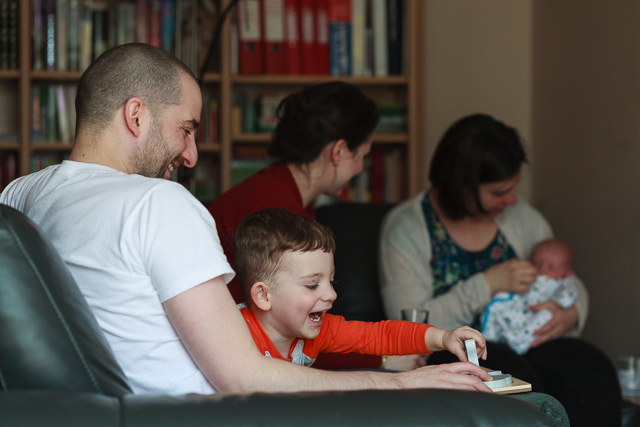 The biggest difference was the autofocus – it is rubbish on the 5D! It is slow, and the nine focus points are clustered around the centre of the frame – the Fuji is able to focus anywhere in the frame. Not having it set up to my liking with back button focus also hindered me – especially for photos like the one above, where I wanted to have the foreground sharp, but frame the shot to include some background interest. Despite the points I made above the 5D still produces great images! Fuji are known for their colour science, but files from the 5D also seem to have a special quality to them. The shallow depth of field from the full frame sensor and fast prime lens is the one area I have had to compromise as I switched to Fuji – it is simply down to physics and camera/lens size is more important to me at the moment. I have been asked to take some headshots for work in a few weeks, and after borrowing my Dad’s 5D I will be asking to borrow it again for the headshots. I am unsure if this would still be the case if I owned a decent Fuji portrait lens, such as the 56mm f1.2 or the 50mm f2, but given the kit I have access to the Fuji loses out this time.